So I’ve had some leftover catfish filets in the freezer for a while now and decided to use it up on this recipe. I’m fairly certain I found this in a Cooking Light magazine a while back but I couldn’t find it online. Combine first 6 ingredients in a shallow dish; stir well. Combine breadcrumbs and pecan meal in another shallow dish. Dip fish in egg mixture and dredge in breadcrumb mixture, pressing firmly to coat. Spray fish with cooking spray. 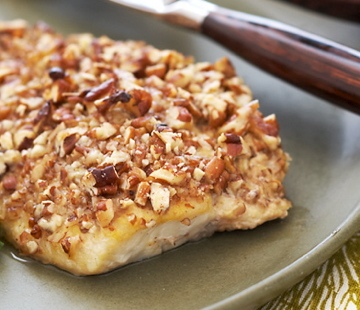 Place fish on a baking sheet coated with cooking spray. Bake at 425 degrees for 20 minutes or until fish flakes easily when tested with a fork. Serve with lemon wedges. I had everything I needed on hand except the lemon which made this dish quick and easy. Oh… and it’s also really, really yummy. I served this with some steamed broccoli and both my husband and I really enjoyed it. This will definitely be served again at my house.